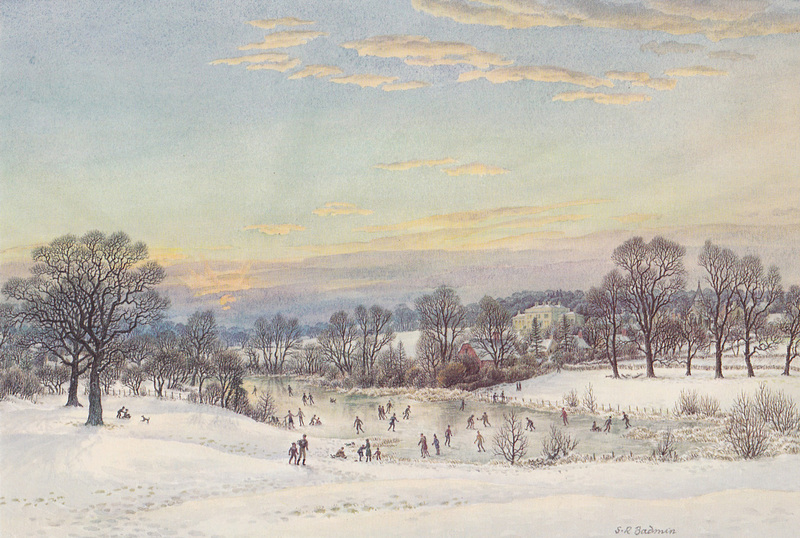 When Gombrich talked about woods, fields, hills and a Church spire in the distance as the “cheap tricks” of English landscape painting, he might have had S R Badmin’s painting in mind – such as this Christmas card , which I discussed in my last internal paper, the reading for which is at the end of this post. Of course, what I failed to recognise was the mutual dependence of (traditional) landscape art and the preservation or creation of (traditional) landscape. I’m not sure what “traditional” really implies, but let’s leave that for now. Badmin paints the scene of skaters on a winter’s evening and we appreciate it as “beautiful,” see the landscape in a particular way – but the landscape is formed that way because the landscape artists of the past (and maybe of the present: see this blog from Cornwall, for example)have taught us to look for it. We look for snow at Christmas (the gale and the rain outside as I type are more like the weather that must precede the flood at the start of The Children of Green Knowe (this is a quick blog post), and as the Grandmother remarks in Green Knowe, “Whoever heard of thunder at Christmas?”), and we look for the Church spire, the trees in the middle distance, a brightly lit sky. The landed creators of estates and agrarian revolution farms looked for (and paid for) landscapes they knew were beautiful. We are into Richard Mabey’s views on the planting of the Chiltern beechwoods. Our “outdoors” is partly formulated by an interplay of economics and art appreciation. Cosgrove and co have already told us this, I know; my reiterating it is maybe my own “cheap trick” about landscape. This entry was posted in Uncategorized and tagged Outdoors, Woods. Bookmark the permalink.